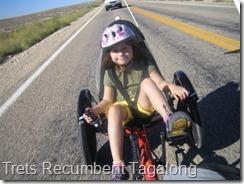 TransAmerican Trike Adventure (TATA) is a dad (Kurt) and his nine year old daughter (Zoe) who think it will be a grand adventure to cycle across the US together on their recumbent trike and tagalong. 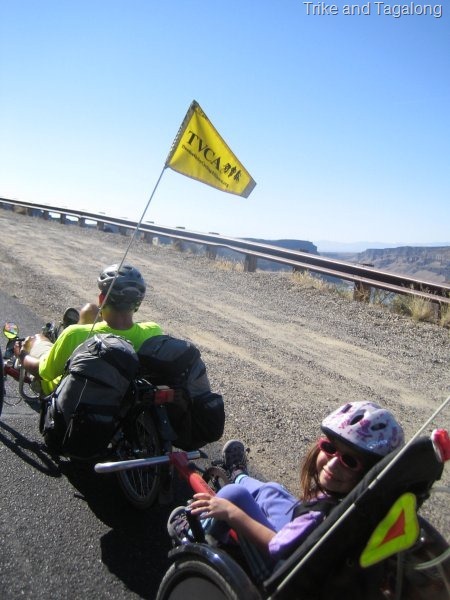 Though technically correct, calling this an unsupported tour isn’t fair to Mom, Lisa, who is holding down the fort back home in Boise while we meander across America on our recumbent contraptions. We’ve allotted five months to travel more than 5,000 miles plus another couple of weeks to pack up all the gear and get back from the east coast via train. Along the way we plan to camp, stay in hostels, partake of Warm Showers hospitality, and occasionally stay in motels. 5,000+ miles reveals the rather indirect route we intend to take across the country, from Eureka, California where my sister lives to Burlington, Vermont where my niece lives. We have a precise route that we may or may not follow. Maybe we’ll discover better routes once we’re rolling or maybe we’ll decide to shorten or otherwise alter the trip. The planned route follows portions of 10 different Adventure Cycling routes and crosses 18 states including the District of Columbia. It picks up some of my favorite parts of the West including northern Arizona and the Grand Canyon as well as the Escalante Staircase which is so far the most spectacular cycle touring I’ve done. In Kansas we deviate from the AC routes because I want to pick up my hometown of Topeka. In Missouri we plan to follow over 150 miles of the Katy Trail. If time permits we’ll take a little detour to pick up Mammoth Cave in Kentucky. If anyone has suggestions for alternative routes or must-see attractions, let us know! Our primary goals are to take each day as it comes and travel slowly enough to enjoy the people and places we encounter. Although we’re doing all manner of planning and preparation, I don’t really know if we’re physically and mentally prepared for this ride. We could surpass our mileage goals, fall spectacularly short, or something in-between. It wouldn’t be much of an adventure if success were assured. We’re shooting for something big enough that we’ll both remember it, for better or worse, the rest of our lives. The only real constants to this trip at this point are a start time in early March 2012 and the train tickets home in early August. We’ll initially be traveling south along the west coast in search of warmer latitudes and to give spring a chance to catch up with us. The final three months of Zoe’s 4th grade education will be via road-schooling. Zoe will follow the curriculum and assignments of her classmates online and her class will incorporate our ride into the curriculum where possible. We plan to do periodic Skype calls with her class as well. Zoe has been playing guitar since she was five and we don’t want to set her back five months so we’re schlepping her guitar along with us. Thankfully she doesn’t play piano. The primary purpose of this blog is to keep friends and family informed of our progress. It’s also part of Zoe’s school writing assignment so expect to hear from her as well. When planning my own trips I find others’ detailed route maps and descriptions to be invaluable so I’ll provide as much of that as I can in hopes that it might help someone else. Finally, traveling by recumbent trike is still enough of a curiosity that I get lots of questions (and stares) wherever I go. This site will give me a way to point people to my standard spiel and offer some jumping-off points for further research into this most rewarding niche of human-powered travel. TERRIFIC grand adventure! What an opportunity for you and your little one. Thanks. Yeah, I think it’s gonna be fun. Thanks for leaving a reply. We are cyclists, well not so much me any longer, but Elson has had bike shops for 40 years and is a strong advocate. We would like to offer you a place to stay in Flagstaff, Az. We have space, many contacts with the local cycling community and would love to have you visit. Thanks for the reply and the offer! I’m not sure we’ll make it to Flagstaff but we certainly might, will contact you if we do. Our current route has us heading north out of Williams to Grand Canyon which would bypass Flag. But routes change :). I love Flagstaff, spent many years flying hang gliders off of Mt. Elden, or flying over from Mingus. Hey Jeff, great to hear from you! For some reason your note got tagged as spam, hence the delay in response. I’ll have to keep a closer watch on that. Zoe will get a kick out of the Camp Zoe link you left. You’re on my list of folks to visit in the Topeka area, looking forward to seeing your Corvair and bikes. And please do ride with us for a bit! Keep in touch. Kurt, this is just amazing! I’m so impressed and excited for you guys, and frankly, envious! We’d love to catch you guys as you come through Topeka or Olathe, where we live. My wife, Julie, is a cyclist and spinning instructor and rode much of the Katy Trail last summer with some of her friends. Hope you’ll let us know when you’re coming through the area … we promise not to slow you down … unless you’re looking for a place to crash, in which case Julie and our 8-year-old twins (Lily and Leah) would totally love to play hosts! Rob! Sounds like you’re right on our route, would love to check in with you and your family on the way by. Maybe Julie has some tips on how best to get through Missouri. Best guess for being in your area is sometime in early June but will let you know when we have a more accurate estimate. Take care. Wow, this sounds awesome.Way to go for following your dream. I’m looking forward to see upcoming posts. I live in Independence, MO ( a northeastern suburb of Kansas City). I see you will be traveling just south of us, picking up the KATY trail. Although the KATY is a fun trail with beautiful scenery, it can be a bit difficult to ride shortly after a rain! The surface tends to swell up and becomes “spongy”, feeling like running on the beach. It would be wise to plan a parallel route in case of recent rains. I am a competent bike/trike technician, and am available for any repairs or assistance when you get within 200 miles of the KC area, all the way to St. Louis. Consider yourselves supported within that area. We also have room for a brief “warm shower/meals/rest/overnight” stay if you would like a break. I have nine trikes of my own, two being homebuilts, plus seven bikes. If you are having any troubles as you get close to this area, I’m sure we can take care of them and get your rig tuned up to continue. If you need any transportation, I can do that for you, Zoe and all of your equipment! Just contact me. Cell-816-560-six eight three six. BTW, be sure to tell Zoe that I have a three year old American Eskimo dog named………what else……….ZOE! Would love to meet up with you when you do get close, at least! Thanks for the support Bruce! Maybe we can ride together when we get to your area. So nice to meet both of you last night at the Davenport Roadhouse. Have an awesome trip.. We’ll be keeping up on your blogs to track your progress and hear about your adventure. Zoe, glad you’ve got your Baby Taylor with you to play! Great show last night, really picked up our spirits after the soggy, windy mess of the night before.